One of the great things about the Ford tractor engine design is that they were designed to be easily and economically rebuilt. The block is made with replacable sleeves. 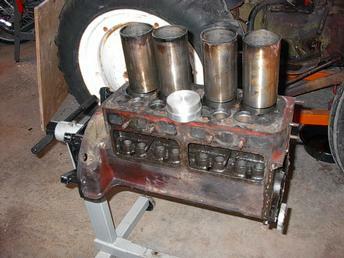 With new sleeves, the engine can be made as-new without the need to bore the cylinders oversize. Earlier N-series tractors used steel sleeves with .040" wall thickness. Later Ns, like mine, have .090" cast iron sleeves. Many "thin-wall" blocks have been bored out to accept the "thick wall" sleeves. Although any machine shop should be equipped to remove/install sleeves (for a price), I happen to have access to a lathe, materials and friends with the knowledge to make a tool to do this myself. I also learned a little about how to operate a lathe in the process. This tool was machined on a lathe out of solid aluminum. A friend of mine has been taking night courses in production methods, so I volunteered him to help me make the tool. Smaller step diameter is 3.18". Outer diameter is 3.35". These dimensions are for thick wall (.090") sleeves. 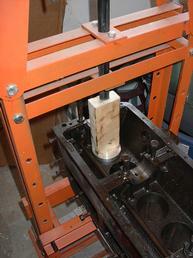 This picture shows the driver and block in the hydraulic press. A wooden block is used to obtain the necessary travel. The block is upside down in this photo. There is a lip at the top of the sleeves, so the sleeves have to be pushed out the top of the block, rather than the bottom. Use of the hydraulic press made the sleeve removal a simple task, once the tool was fabricated. The press came from Harbor Freight many years ago and cost about $100. It has proven useful on many occasions.